We are now able to offer special financing to qualified homeowners! Here at GRM Electric we pride ourselves on being straight forward when it comes to pricing. For larger jobs we like to come look at the job in advance and give you a free written estimate, However there may be times when you need something done quick and would rater we just came and took care of it on the spot. For this reason we do have an hourly rate for service calls and that rate is $99 in our home service area and $129 + tax in our extended service area. This does not include any material we may need to supply. We feel that this rate is fair and competitive with other licensed competitors and necessary to cover the cost of a trip, Use of our trucks/ tools and insurance coverage we are required to carry. These rates are for during our normal business hours. 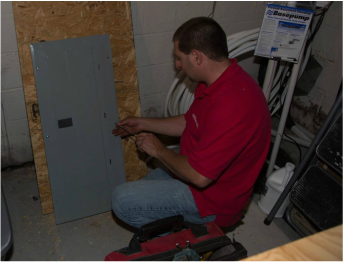 A service call is considered anytime tools come off the truck and troubleshooting is involved. If you just need an estimate we offer visual written estimates free of charge. *We seldom take deposits or down payments on small jobs, Service calls or quick repairs. A deposit for such jobs is not necessary however we do ask that you pay for the work in full at the end of the job on the day the work is completed. Payment method of your choice. 3.) If a job is a 2 or 3 part job and can not be completed all at once. Credit cards over the phone.